This intensive weekly treatment is good both immediately and in the long run – it restores essential hydration from the off and enhances hair’s resilience to protect it against future damage. Perfect for those with dry, damaged or chemically-treated hair, using this deeply conditioning mask gives stressed-out tresses some much-needed TLC every week – no despairing necessary. Getting to work in mere minutes, Briogeo’s Don’t Despair, Repair! 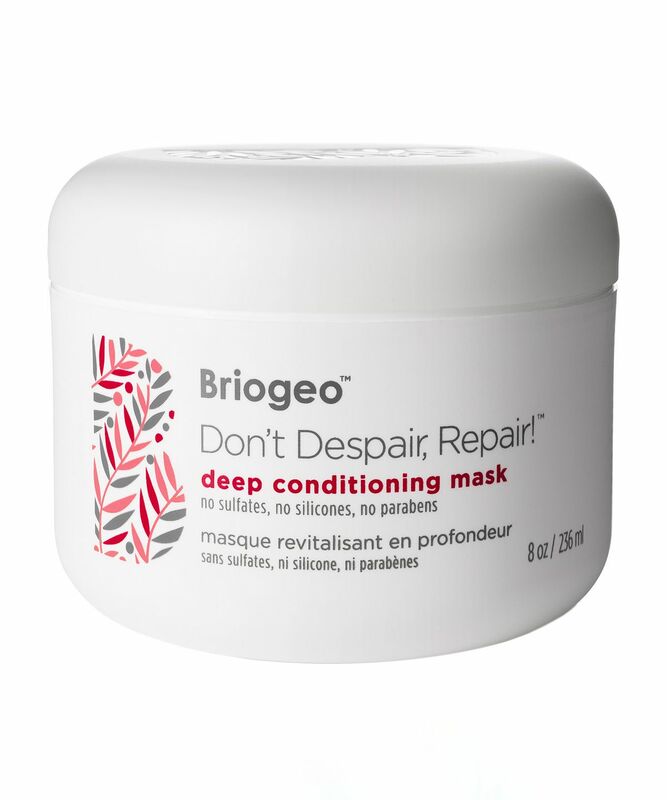 Deep Conditioning Mask restores essential hydration and natural vibrancy to dry, brittle, over-processed and lacklustre locks. Like a moisturising drink for thirsty manes, it’s formulated with Briogeo’s unique NOVA Complex, which contains an optimal blend of transformative nutrients from B-vitamins, rosehip and argan oils, algae and biotin to replenish damaged hair and leave it shiny, glossy and healthy-looking. It’s safe for colour-, keratin- and chemically-treated hair and is sure to be the highlight of your head’s week. It should be used once per week or every two weeks. In between treatments, it is recommended to use one of Briogeo's shampoo and conditioner sets (sold separately). I am currently doing the acne treatment that not only gets my skin super dry but also my hair. It was starting to look very dry and lifeless. Now the one day per week that I wash my hair I leave this hair mask overnight and in the morning I just rinse the product and my hair is back to life! I know that it is a bit on the pricier side but in reality a little goes along way and the 236ml lasts very long! Freaking amazing! Best hairmask i have ever used! I looove this hairmask. I have very long hair, and therefore I need to treat it well, and this mask does everything for me, my hair is so soft afterwards. I also love that Briogeo is 6-free. Would very much recommend, and I have rebought it also. I was persuaded to try this by the good reviews and recommendation from Ingrid Nielsen. I have recently highlighted hair and needed a mask to help repair my hair and restore hydration, softness and shine but after using this my hair felt very dry and brittle. My hair does react like this if I use a product that contains protein but this has no protein listed in the ingredients. So overall very disappointing. It does what it promises, smells amazing, but to achieve the best result (when I can) I leave it in my hair for 30 min or longer. This stuff is amazing. I never had such soft hair after using this. And it lasts a view hair washes. I will buy it again for sure. I used to straighten my hair, colour it and use horrible hair products from supermarkets filled with Silicones, Parabens and sulphates. I use Briogeo to be kind to my hair with Kale and Matcha shampoo, Ouai repair conditioner and this Briogeo mask and then my hair is dry I use coconut oil and my hair is silky shiny and almost frizz free. Leaves my bleached hair, especially the dry ends, really hydrated and soft! I am not a huge fan of the scent though. First use and I could see my hair were softer and the smell reminds me of a salon sent (without being over powering). It weighs my hair a bit down just because I put it in my roots too. I think I found my go-to hair mask! It keeps my hair soft and frizz free for days, absolutely amazing product, will buy it again. I recommend this mask, it helped my dry bleached hair. I bought this on the recommendation of Tati Glamlifeguru and I think it’s awful. It did nothing to my pretty much normal hair that just likes a good condition one or twice a week. It smells horrible due to the no no’s in it. However, I use a lot of products that don’t contain babies such parabens and they still smell good. Overall don’t waste your money. I use this mask three times a week for a while now. I don’t see the WOW effect, although my hair feels nice. No totally different than before. I do love the smell and since this brand uses good ingredients I am going to repurchase this and try other products as well. My dyed and brittle hair has been transformed since discovering this product. I have been amazed. I use it as a normal conditioner and even recommended it to my hairdresser! I don’t quite have the absolutely silky, glossy locks I crave, but I’m a lot closer when I use this product. 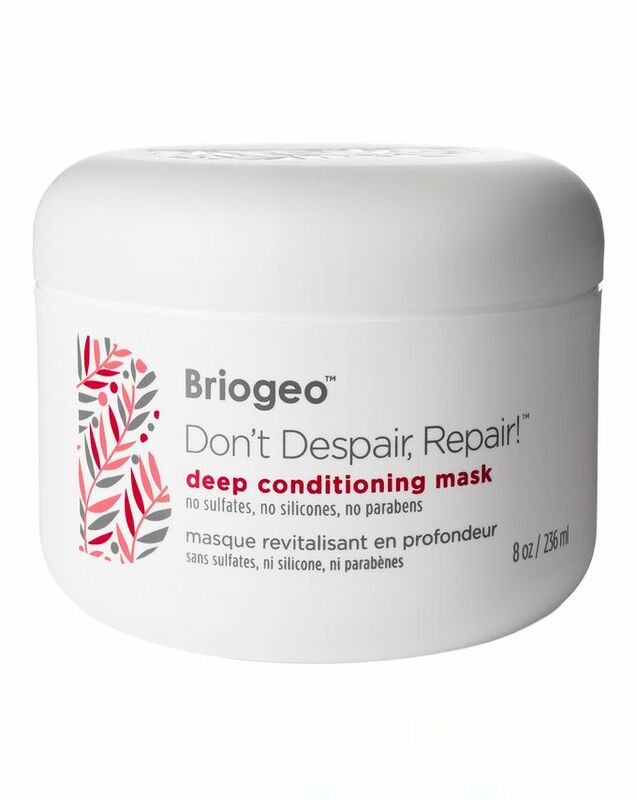 I fell in love with the whole Briogeo range, it has saved my curls, and this mask is a dream, I use it the "Don't Despair Repair" as an overnight mask, it has definitely given me the moisture my hair lacked, I also use the gel to oil, and it works just as well. I read such good reviews on this but as soon as it came to use it my hair was dry and wirey. Disappointed. I have genuinely never had my hair feel so soft and smooth. I have thick and long hair which is usually dry, tangled and frizzy. Since using this shampoo and mask my hair has been so incredibly soft and smooth. I couldn't recommend this enough. I usually leave it in for 10-15 mins whilst watching a youtube video to let the conditioner sink in for longer. I love this hair mask! It makes my hair soft and shiny. It moisturises my hair but doesn’t weigh my fine hair down. It is ok, but just that. To me it doesn't do what it should. It smells nice though. I received this in my Cult Beauty Goodie Bag. It is a really nice mask for my curly hair. My hair feels really soft after using it and the ends feel less dry and tangle less easy. Amazing hair mask without silicon. Perfect for extensions too! This mask is brilliant. I have very fine, coloured and, thus, fairly damaged hair. This is nourishing but never weighs down my hair. It smells glorious and doesn’t contain any of the dodgy ingredients some shampoos and conditioners do, which is excellent as I have a very sensitive scalp. Highly recommend. It’s the best Hairmask ever. Very happy to find it. I use this mask as a conditioner once a week. I live in the desert, which is a very dry climate that has in turn dried my hair out. I put this mask on in the shower and within minutes I’m running my fingers through de- tangled, silky locks. I also use purple shampoo, which tends to dry my hair, but when I follow the purple shampoo with this mask my hair is re hydrated and happy. I absolutely love this product – not only is it free from harsh chemicals that most other hair products contain, but it really does work. My hair is always shiny and healthy when I use this and for that reason I have forsaken all other conditioners for this! Wonderful product. Botanical. I love it. Helps my hair to be healthy. It does what it promises, smells amazing, but for me to get the best results I have to keep it in my hair for 30 mins+ before rinsing it off. This means I don’t really have the time to use it that often, but when I do, it doesn’t let me down. The! Best! Conditioner! Ever! I have curly, frizzy, silky hair, with exceptionally thin strands which are not much improved with my regular bleaching. My hair usually looks pretty good first few hours after washing, but pretty soon I start looking like a dandelion... the fluffy white version. About second or third time I used this mask I could see definite improvement. My curls remained nicely formed for much longer, my dried-out bleached ends now look as if they've never been chemically treated....couldn't recommend more. It is a very good product. The scent of this product is incredible and shiny. The scent of this product is incredible, it makes my hair really smooth and hydrate but nothing more, the price is a little bit too much. In the end is just a regular product. Is a very good product, my hair feel very soft, healthy and shiny. I will buy again these products. Happy. It's a very moisturizing hair mask, and my hair feel so soft after I use it, but is just not worth the price. I use my Watermans conditioner and it makes my hair even bit more soft than this mask. I have naturally curly hair and this mask is so lush. I leave it on for 30 mins after I shampoo and condition with the Briogeo Curl Charisma range. It leaves my curls soft and beautifully bouncy. Lovely mask. I have course hair & really made the difference. A must have if you need to hydrate & tame your tresses. I was absolutely blown away by how soft and silky this left my hair, I wasn’t expecting it to be THIS good! Expensive but worth the money. Left my hair soft and silky! This is such a nice product, leaves my hair silky smooth. I have really think hair and a little does go a long way. It's first mask which leaves my hair restored even a week after. I can run my fingers trough my curly bleached hair and they do not stuck. I use it once a week for a half an hour. I have tried it like a regular conditioner and there is less effect. Recommend it! Best mask I've ever tried. Out of this world effective, even though I'm not crazy about the smell. My hair has transformed since using Briogeo. I bought this because I had heat and bleach damaged hair that was super thin and limp but this product brought it back from the brink! It makes hair so smooth and lightweight, unlike other deep conditioning treatments that really weigh down your hair. I’ve been using it for about a month now and it’s really changed my hair. You only use a really small (10p) sized amount so even though it’s expensive it goes a really long way. I’d recommend the method where you hardly your hair under a plastic cap for 20 minutes for really damaged hair too. It doesn’t fuse split ends or anything like that but it does give your hair back some bounce and makes it feel fresh from the salon! I bought this mask because of the high ratings, in my case, it did not help me. My hair is thin, wavy and dry. I did not notice the difference. Only used a sample of this mask but the difference is visible. Best hair mask I ever tried. Leaves my dry hair silky smooth and as soon your hair is dry, you can see how silky they feel and look. Will buy full size. I was expecting more from this... it did no more than other, less expensive products, so for this price I don't think is worth the money. The best conditioner I have ever used. It's like putting gold on your hair. First got a sample of this in one of the beauty gift boxes. Absolutely loved it. Before this, my hair was like hay. No amount of conditioner, and I had tried a gazillion of them, worked. Within 5 minutes of putting this in my hair, I noticed my finger could actually go THROUGH my wet hair. Usually, the fingers would just get stuck until I separated my hair clump by clump. Magical stuff. Now buying biggest tub I can find.